Ready to upgrade your garbage receptacle? We’ve got you covered with the style, closing mechanism, and odor control feature that’s just right for you! The best kitchen trash cans not only hold garbage, they do so in a sanitary, unobtrusive manner. If you have a too-small can that regularly overflows, or if the liners keep slipping down and causing slimy spills at the bottom, it’s time to step up your garbage game. You may also be looking for a can to control odors, as well as one that enhances—or at least won’t detract from—kitchen décor. Read on to learn which features are worth paying for, and find the models that made satisfied customers out of consumers just like you. The average family generates two to five bags of kitchen trash per week, and the most common kitchen-size trash cans hold 13 gallons (50 liters). If you live alone or aren’t home enough to generate that much trash, consider a smaller can that holds eight gallons (30 liters). The standard 13-gallon size, however, is best for most folks because it easily accommodates such large items as gallon milk jugs. Many people find the 13-gallon size large enough to keep from having to take the trash out more than once a day, but not so large that it looks out-of-place in the kitchen. Kitchen trash cans are typically made of heavy plastic, polyvinyl chloride (PVC), or some type of metal, often stainless steel. Plastic and PVC are the most affordable, starting around $15 for a budget model and running as much as $60 for one with hands-free operation. Metal trash cans cost a bit more, starting around $30 and topping out over $300 for designer models in custom colors. No need to go into sticker shock just yet, though: The best kitchen trash can—one that’s a durable, good-looking metal—can be had for around $100, or less. Even if you have ample under-sink space for an uncovered trash can, one with a secure lid is still your best bet. A lid will help hold trash bags in place, keep smells at bay, and deter curious pets that want the remains of that tuna fish sandwich you had for lunch. Inexpensive models often have domed lids with a swinging door attached by hinges. Users simply push the door to deposit trash. There’s no need to remove the lid unless you’re tossing a large item that won’t fit through the door. However, if you cook a lot, the last thing you want to do is contact any part of the kitchen trash can with your hands while preparing meals. You’ll be best off with a touch-free lid, that opens either by stepping on a pedal at the base of the can or by activating a sensor that responds to a hand motion. Both options are good; how good depends on the quality of the opening mechanism. A cheap sensor or an inferior step-pedal that only lasts a month before breaking isn’t worth the money you saved on the initial purchase of the can. Some kitchen trash cans include activated charcoal filters, located in the lid, to help absorb odors—a wise option if trash regularly sits for more than two or three days. Odor-controlling filters, which should be replaced every two to four months, get mixed reviews, however: Some consumers think they’re great while others feel they don’t make much of a difference (and none of the top picks contending for the best kitchen trash can, below, include this feature). If you don’t wish to spring for a filter option, you can always buy deodorizing trash bags, sprinkle a little baking soda over garbage, or simply empty your trash more often to keep smells at bay. You can also deodorize a trash can with one of these hacks. Check out this trio of trash cans. 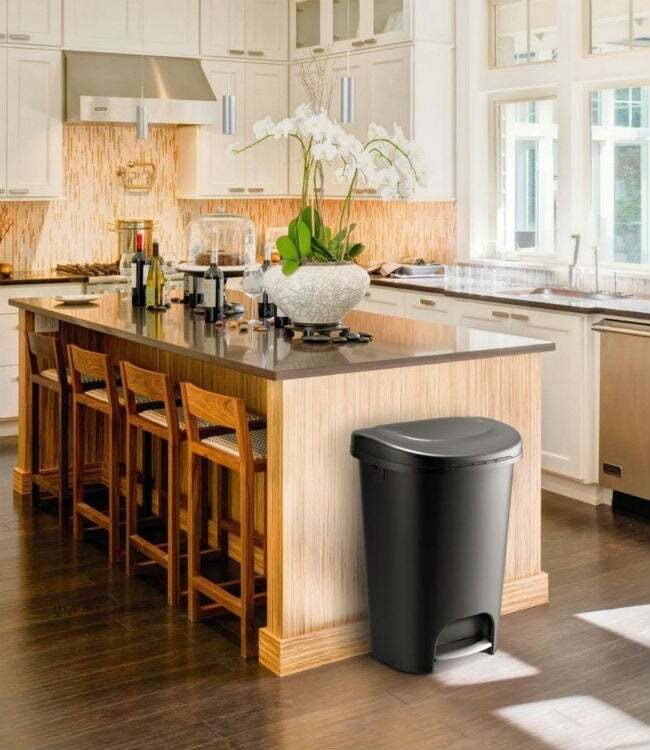 Not only do they tick off all of the boxes of what we look for in the best kitchen trash can, but each one has been highly ranked by consumers and rated by independent reviewers as the best buys for your money. Start your shopping here. For sleek, stainless steel good looks and hands-free operation, the men’s style authority GQ made the Simplehuman Rectangular Step Can its number one pick while Amazon customers agreed, awarding this model a 4.6 out of 5 stars. The step-pedal is designed for heavy use, advertised as lasting for up to 150,000 steps without breaking. 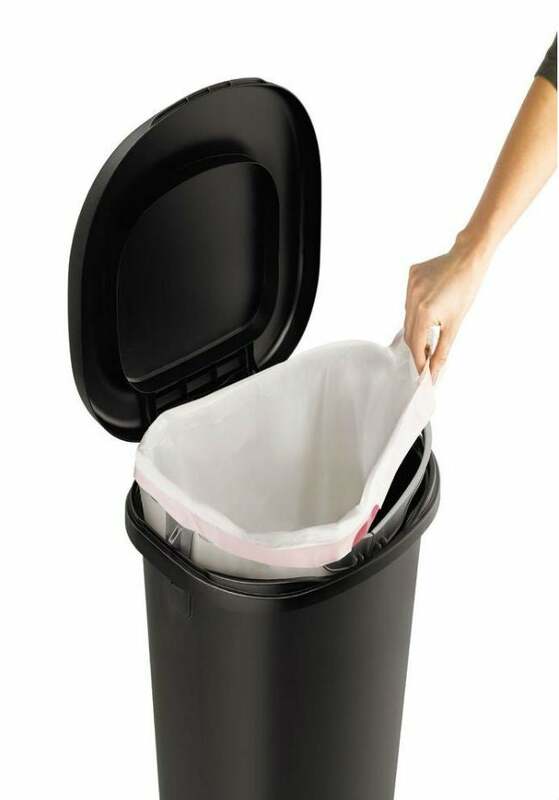 While the 11.9-gallon (30-liter) capacity holds about one gallon less than the average kitchen trash can, you can purchase the manufacturer’s own (Code M) liners that fit the interior perfectly; that said, most customers claim standard 13-gallon trash bags work just fine. Buyers also appreciate the shallow profile that tucks unobtrusively against the wall. The exterior surface is easy to wipe clean, and if traditional stainless silver isn’t your style, choose from Rose Gold, Black Stainless, Dark Bronze, or White Steel to better suit your kitchen décor. The best part? This can boasts a 10-year limited warranty, should it not pull its weight. Available from Amazon. 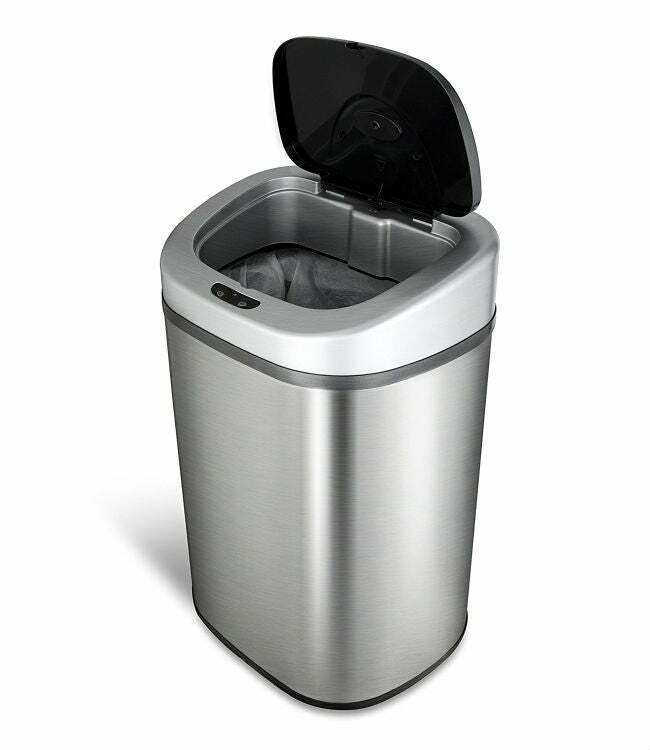 If you’ve got family-size trash, check out the larger bin on NINE STARS’ Touchless Motion Sensor Trash Can. With a 21-gallon (80-liter) capacity, this brushed stainless steel can not only looks good, it holds quite a bit more than the standard 13-gallon bin. The Spruce gives it their best, “high-end” trash can award, citing its quick-open motion sensor that responds to a mere wave of the hand. The sensor requires three D-cell batteries that last an average of six months. The attractive stainless steel surface resists fingerprints and the can’s non-skid base keeps it from scooting across the floor if it gets bumped. A removable ring liner holds trash bags securely in place and also conceals the top of bag for a clean look. You can purchase the manufacturer’s 21-gallon plastic liners or go with generic 20-gallon bags from your local grocery. The NINE STARS trash can comes with a limited two-year warranty. Available from Amazon. 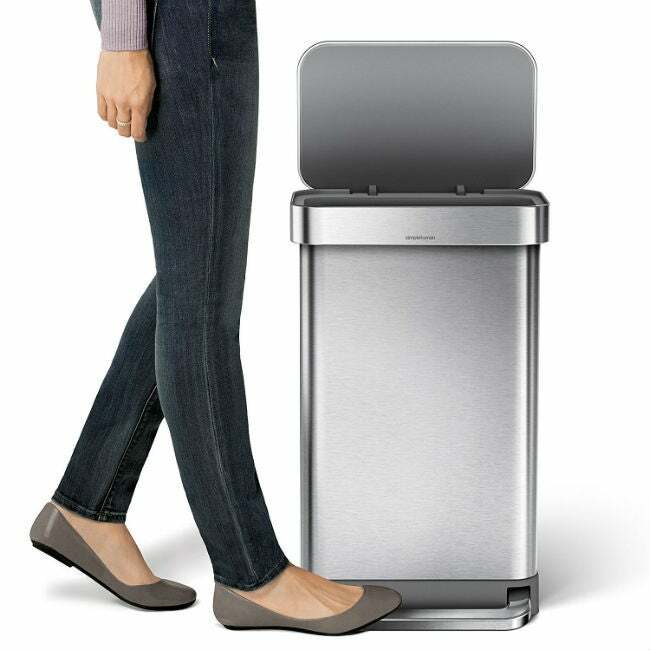 For a budget-friendly model that holds up to daily use, the Rubbermaid Step-On Wastebasket took Business Insider’s “best affordable trash can” honors for good reason. It’s durable, and it comes with a stainless steel step-on pedal so you won’t get your hands—or the lid—dirty when disposing of garbage. The heavy plastic bin accommodates standard 13-gallon bags and is easy to wipe clean. The lid features an attached ring that secures the top of the bag to prevent slippage and, according to Home Depot customers, who give the Rubbermaid Step-on Wastebasket 3.9 stars, it fits snugly enough to prevent odors from escaping. No manufacturer’s warranty here, though. Available from Home Depot.